The Ministry of Health in Suriname with support of the Ministry of Health in Brazil currently has 4 malaria technicians in Belem, Brazil for a certified malaria microscopy training. Three of the technicians are working for the Malaria Program and one technician is employed by the Bureau of Public Health. This activity is part of the bilateral cooperation agreement between Suriname and Brazil (ABC projects). 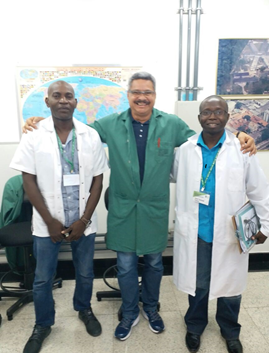 Photo: Mr Koffie (Malaria Program Suriname ) and Mr Fortune (Bureau of Public Health Suriname) with their Brazilian trainer at the Evandro Chagas Institute in Belem (Brazil).